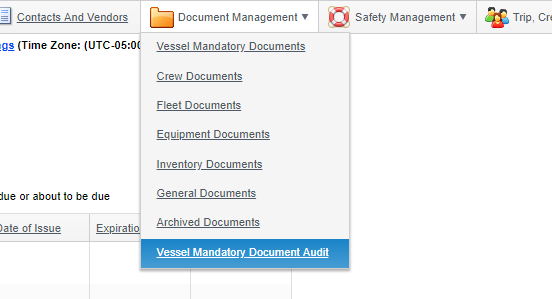 To run a Vessel Mandatory Document audit click 'Document Management' - 'Vessel Mandatory Document Audit'. This will immediately give you a table which will show the status of every Vessel Mandatory Document assigned to this particular account, along with the date of issue, expiration date, and survey date (if entered). It will also highlight any expiring documents with a red icon and any documents with upcoming surveys with a yellow icon. Pro Tip: You can view more details about any uploaded document by clicking the 'View Document' icon, which is to the left of the document title. 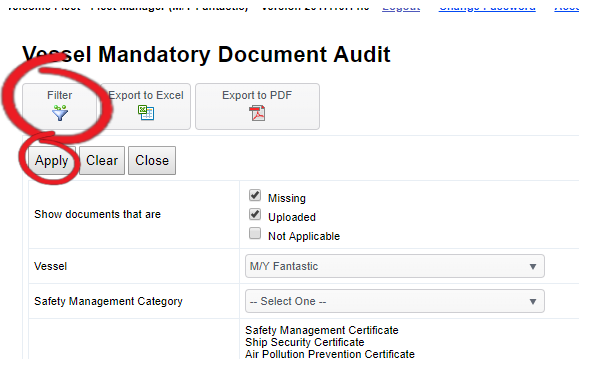 You can also filter the report by clicking the 'Filter' button, selecting your criteria and then clicking apply.